Tqilakaze 2 SHOTS IN THE BOX! You can do two 25ml shots or one 50ml shot. If you like shots, you’re gonna love this! 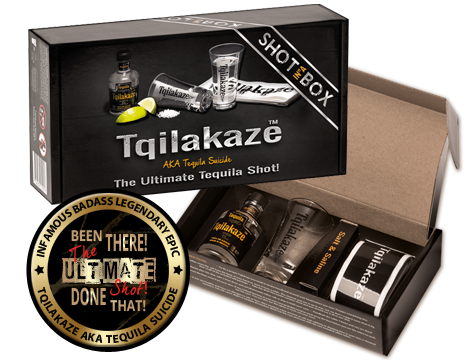 Tqilakaze, the ultimate party shot and the perfect gift. Join the brave and commit Tqilakaze at your next party! This is an ultra premium set, composed of the highest quality components and it can be used over and over again. 1 Bottle (50ml) Premium Tqilakaze Blanco 100% Agave Tequila 38%. 1 Shot glass with Tqilakaze logo. 1 Headband with Tqilakaze logo. 1 Salt sachet (1g). 2 Saline tubes. 1 Tqilakaze coaster. 1 Fake 500 € banknote. Lime NOT included! 1) Put on the headband. 2) Pour salt on your hand and sniff it up your nose. 3) Take the shot. 4) Drip lemon/lime in your eyes. 5) Headbutt the table three times. 6) Done:-) Finish with cleaning out your nose and eyes with the included saline. It might surprise you but it’s way less extreme than you might think. You decide yourself how much salt you snort and how much lime you drip, if you keep it on the low end the shot is very easy to do. It’s fun and thrilling to take the shot and VERY fun to watch someone do it 🙂 The key to feeling great after the shot is using the included saline solution. It gives instant relief in both nose and eyes. Taking the Tqilakaze shot is deemed harmless if you are in good health and have no allergies to lemon/lime or salt. If you have concerns regarding sniffing salt or dripping lemon/lime juice in your eyes you should not take the shot. Sniffing small amounts of regular table salt may cause a burning feeling in your nose and cause a runny nose each time you do it, but not much else. You can flush your nose with saline if you feel you need to and it should clear it out. Lime and lemon contain diluted natural citric acid up to about 0.25 M and as such is considered low hazard. A citric acid is considered diluted if it is less than 1.0 M.
Even dilute solutions will cause discomfort in the eye and possible side effects may be, red eyes and slight to medium discomfort. The eye quickly protects the cornea by profusely tearing and washing the acidic lemon/lime out and you can speed up the process by using the included saline solution to wash out the eyes. If you rubbed the lemon/lime into the eyes you should wash out the eyes with water and then use the saline solution in the eyes. If you are healthy and have no allergies this should completely alleviate any discomfort.